If Nietzsche were writing last week's update, it would be Uberstench; Amazon picked the wrong day to celebrate AWSome Day; the state of native advertising technology; Twitter's new abuse blocking standard; Facebook's AI goes to work for good; Snapchat user numbers; lists of companies working on autonomous vehicles and leading AI; Google has to learn hate speech; music discovery is coming from a surprising source; video is the new blogging; Internet providers may be able to sell your data; how to change minds; and more in this week's edition of The Full Monty. And don't forget to subscribe to The Full Monty podcast and check out where Brain+Trust is speaking this week. On Tuesday of last week, Amazon's web servers went down, and the impact was felt across the Internet, affecting entire websites to images and more. Amazon Web Services (AWS) powers as much as 1/3 of the Internet. A wide variety of sites and services were rendered inoperable, including Quora, Trello, IFTTT, Expedia, the SEC, Wix-created sites, Mailchimp, Apple's App Stores, and many more. In addition to sites, the outage also took down Internet of Things objects such as Alexa, Nest systems, and even light bulbs. Makes you stop and wonder how we'd survive in the event of a major power disruption or catastrophe when nothing works any more. The ultimate culprit in all of this? An engineer's typo in a standard command that was designed to remove a small number of servers. And it was definitely the wrong day to be celebrating AWSome Day. True story. Such a widespread outage is obviously problematic for a number of industries — and it should cause concern about where we host services. Amazon should be concerned as well, since AWS plays a significant role in Amazon's finances, netting over $3.5 billion in revenue and $926 million in profit in Q4 of 2016. There's an opportunity here for any large entity (Microsoft? Apple? Google? Walmart?) that wishes to compete with AWS head to head, in which they could create or expand a parallel web services offering that compete with Amazon's only profit center. Last week, we highlighted the importance of interplay between digital and in-store experiences in retail; this week, we revisit that topic with the acknowledgement that brick and mortar isn't dead, but it's suffering. Some of the pervasive issues affecting the retail industry include: a sea of sameness, independent entities versus integrated channels, customer experience hiccups, lack of wow factor, and treating all customers the same. Facebook is beginning to roll out its solution to fake news: flagging questionable content with a "disputed" label. A slew of new digital tools like PolitEcho, FlipFeed, and Read Across the Aisle aim to bring online audiences outside their political bubbles. This, more than any automated flagging solution, is an important part of reducing the spread of false information. NRKbeta is combating trolls up front: the site is requiring readers to pass a quiz about the content they (supposedly) just read before they're allowed to comment on articles. These 10 breakthrough technologies all have staying power. They will affect the economy and our politics, improve medicine, or influence our culture. Some are unfolding now; others will take a decade or more to develop. But you should know about all of them right now. 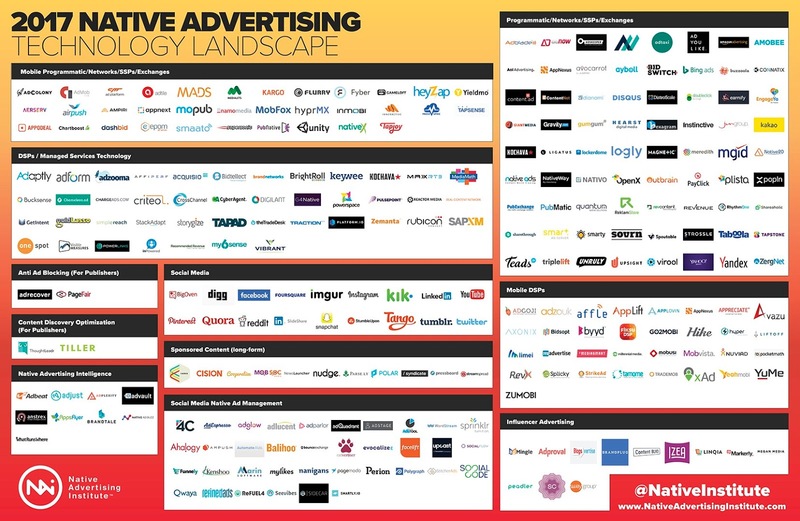 A look at the increasingly complex world of native advertising technology in 2017. Twitter has extended its abuse blocking to the main timeline. Now users can mute tweets containing certain keywords, phrases, hashtags or emojis from appearing in their timeline. Twitter's clone in China, Sina Weibo, will soon have more users than Twitter. The product shows more ad revenue and has evolved its product more than once — something Twitter has not yet mastered. The New York Times is publishing its journalists' tweetstorms in its print edition. Giving additional and more permanent life to Twitter commentary is a clever move that will help spread and preserve such correspondence that would otherwise be easily overlooked. It's a technique that brands might consider as well. Facebook is testing emoji reactions, including a thumbs-down button, on messages in Messenger. Keep an eye on this development. What gets rolled out in Messenger often times is more broadly applied. Facebook wants longer videos, yet its Insights function no longer has a video metric for views lasting more than 30 seconds, replacing it with a metric for views of 10 or more seconds watched. Artificial intelligence used at Facebook can spot suicidal behavior in Live video broadcasters and offer them assistance and resources in real time, when they need the help. Related: a look Inside Facebook's AI Machine that helps Facebook see, talk and understand — and even eliminate fake news. Evidently, Facebook can help sway elections — for a price. No, it's nothing nefarious as that; it's a matter of fine-tuning the targeting and applying paid media. If an advertiser wants to buy Instagram's Story inventory as a standalone (no other Instagram or Facebook inventory), it can do so while still using Facebook's self-serve targeting tools. Facebook is launching a video app for Apple TV. It's social TV — videos are organized in horizontal columns by a variety of different categories: Shared by Friends, Following, Recommended for You, Top Live Videos, Saved Videos, and Recently Watched. YouTube debuted YouTube TV, a $35/month service including broadcast networks, about 30 cable channels, cloud DVR with unlimited storage, personal recommendations. This will be a stand-alone app, separate from the subscription-based YouTube Red. Google got itself into trouble with multiple messaging apps. Might video be going the same way? We're now watching over a billion hours a day of YouTube videos, a 10-fold increase since 2012, threatening to eclipse US TV viewership. Not me personally. But I wouldn't put it past my kids. Leaked Snapchat emails show that the company told an anti-gun charity that NRA ads might appear on their videos if the charity didn't pay for advertising. Together with the Uber stories below, this kind of ethical conflict might make you question which apps are on your phone. Snow is Snapchat's competitor in Asia, and it is a "Snapchat clone" that is tailored for the Asian market. 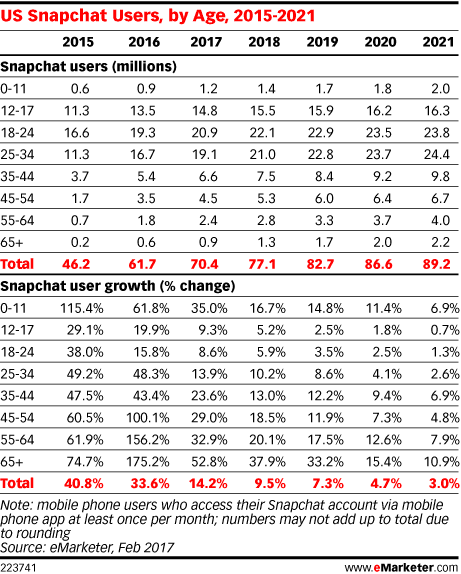 New Snapchat user numbers indicate that older groups are now more likely to tune in for content. The platform has multiple partnerships with television networks for mini-episodes. Meanwhile, the younger groups are less likely to add Snapchat when Instagram Stories can fulfill their broadcasting needs. The fallout from the major security/data breach at Yahoo resulted in the firing of its top lawyer. CEO Marissa Mayer, on the other hand, won't get her bonus. Just another reminder of our podcast/post last year that requested Marissa A. Mayer Will You Please Go Now! The on-demand grocery delivery company Instacart is raising a whopping $400 million on a $3 billion valuation. Is this a wise investment, given how many grocers are offering this service as part of the shopping experience? As the Uber Turns... the soap opera continues as the company continues to get hammered with negative news that includes its corporate culture, bad boy CEO, personnel issues, underhanded use of technology, and lawsuits. Good times. After a week of pressure about its corporate bro-culture, Uber CEO Travis Kalanick found himself on the hotseat when a video surfaced of him berating a driver. Kalanick's immediate response (always reactive with this one) was to say that he must "change as a leader." Well, sure. Once he got caught. Knowing full well that a leopard can't change its spots, Kalanick is now looking for a second in command. This could be an inflection point for Uber; Mark Zuckerberg brought in Sheryl Sandberg as his COO and Facebook has been on a steady climb ever since. It could be more than a maturity thing; it's a matter of the skills of a founder versus an executor. Uber’s SVP of engineering is out after he did not disclose he left Google in a dispute over a sexual harassment allegation. Ouch. How Uber Deceives Authorities Worldwide: According to sources, Uber has a program in place called Greyball that identifies enforcement officers and stealthily prevents them from successfully hailing cars, to help drivers avoid sanctions. A London regulator wants private hire drivers to prove their reading and writing skills in English. Uber took the regulator to court and lost the case. How bad is Uber's bro-culture? It still operates on the same philosophy as Jack Welch's GE from the 1980s. For one employee to get ahead, another must fail. What can Uber do to fix its broken culture? It needs a specific plan for what everyone needs to do to make the place more inclusive. After all of this questionable corporate behavior and deficit of ethics (not to mention previous legal and ethical issues), you really should be asking yourself, "Should I still be using Uber?" Your editor has deleted it from his phone. Will ride-hailing be free by 2021? If ad platform Vugo has its way, you'll watch ads to earn ride credits. Sounds freakily like the Black Mirror episode "Fifteen Million Merits." Lyft is seeking a $6 billion valuation after its latest round of funding for $500 million. The cash infusion could help it seize the moment as Uber contends with image problems. Lyft might position themselves as the un-Uber. JetSmarter, the "Uber for jets," wanted the credit card number of a Verge reporter, so that it could charge them $2,000 if they didn’t publish a positive story within 5 business days. They really are the Uber for jets! The definitive list of 33 corporations working on autonomous vehicles. Just wait. It'll be up to 34 before the week is out. How do you create a map showing every road in the United States, with the precise location of every stop sign, all the lane markings, every exit ramp and every traffic light — and update it in real time as traffic is rerouted around construction and accidents? Behold, one of the great challenges of autonomous vehicles. Here are 50 companies leading the artificial intelligene revolution. Amazon is adapting Alexa to use in customer service instances that will mix with other forms of support, ultimately allowing clients to build their own ideal customer service experience. It takes at least seven years to receive the proper training to become a doctor. But a supercomputer only needs a fraction of that time. Now, AI and machine learning are changing the way healthcare functions. Google announced announced Perspective, a tool that uses machine learning to police the internet against hate speech. However, the machine doesn't intuitively understand hate and must be further developed to interpret phrases. Just like children, it has to be taught hate. Competition in the VR headset space is heating up and Facebook has slashed the price of Oculus Rift. Spotify announced another major milestone yesterday, as the music-streaming giant revealed it now has 50 million paying subscribers. And yet, the company is still not profitable. How can that be? Spotify is preparing to launch a lossless audio version of its streaming service, currently called Spotify Hi-Fi, will offer lossless CD-quality audio to users. Spotify more than doubled its position as a music discovery channel since last year. Done well, streaming audio sites have lots of potential for music discovery (and therefore advertising). SoundCloud is offering a cheaper $4.99 subscription plan. Brands obsess in the reverse order. It's an art, not a tactic. Program of the Week: Given our link above about broadening your political and news sources, our recommendation is KCRW's Left, Right and Center. American political discussion featuring a pundit from the left, right and center. Refreshingly civil, well-rounded, smart discourse. Do you have a program to recommend? Add yours to our Google Sheet: smonty.co/yourpodcasts. Video is the new blogging: research from Convince & Convert and Vidyard indicate that there's more attention than ever being paid to videos today. In fact, 53% of videos that are 90 seconds or less are watched to completion. The secret to marketing and customer experience success often boils down to one thing: empathy. You might be interested to know where our modern perception of empathy came from. The FCC has taken steps toward delaying its own rules protecting consumer privacy, which means that they won't be able to stop Internet providers from selling your data. Good. I hope they can see the gesture I'm making right now. As we've previously shared, Alexa has been called as a witness in a murder case and Amazon is claiming First Amendment rights and protection of consumer privacy. But the question should be asked: just why is Amazon sitting on all of this data? President Trump's advisers and career civil servants have spawned an encryption boom in Washington, DC as they try to conceal communications with employees and the press. The same might be happening at your business, which makes it all the more important to ensure you're building a culture of trust, transparency, accountability, and collaboration. Everyone has a boss, and sometimes they ask for metrics you don't care about. Metrics that matter. Media buyers are calling on Snap to prove ad efficacy with third-party measurement, following similar moves at Facebook and YouTube and the MRC (also reported last week). It's not the ink, it's the think: six data visualization strategies to help you simplify and press the right emotional buttons in your presentation of data. Given your role, you'll likely be called on to make a presentation or you'll have an idea for how a process might be improved. Doing so will require you to think about how you'll change people's thinking, and in preparing for that, you'll want to read How to Change Minds: Blaise Pascal on the Art of Persuasion. "The surest way of defeating the erroneous views of others is not by bombarding the bastion of their self-righteousness but by slipping in through the backdoor of their beliefs." The top leadership actually wants to invest time into fixing what’s broken… not discussing what’s amazing. How to Tell Your CEO What They Really Want to Hear. Have you heard of the Dull Men's Club? This international society of men who love being boring includes collecting hubcaps, the appreciation of new socks, and the 2017 Calendar of Post Boxes and Telephone Boxes of Wales. As the documentary is titled, these guys are Born to be Mild.